Update: After more than 50 years in operation, Akamba Bus closed its doors in May 2012. Jump to this comment to find out what my current recommendation of bus operator on this route is. If you would like to know “how many hours from Kampala to Nairobi by bus”, “how long does it take from Kampala to Nairobi by bus”, “how many hours from Nairobi to Kampala by bus”, or “how long from Nairobi to Kampala by bus”, you can find that answer here. This is the first post in a 3-part series. Click here to read parts II and III. Have you ever traveled by bus from Nairobi to Kampala? If so, what bus service did you use? Did you travel during the day or at night? What route did you choose? I make this journey all the time! To tell you how much, let me just share that one month of March, while working in Nairobi and not on leave, I spent three of the four weekends of the month in Kampala. Although occasionally I fly between these two destinations, I do so rarely because of the exorbitant price of air travel on this route. Traveling by bus is 8 times cheaper and is convenient enough, especially when I’m not particularly time-constrained. Many bus companies serve this route. The only three that are worth knowing about, in my opinion, are Akamba Public Road Services, Scandanavia Express Services, and Regional Coach Services (which I will refer to from now on simply as Akamba Bus, Scandinavia, and Regional). Of these three, Akamba Bus and Scandinavia are by far the superior services, though when the need arises, Regional is an O.K. alternative. I will tell you about these services in a three-part series. In this first post of the series, I will tell you all you need to know about making this journey with Akamba Bus. In the next two posts, I will tell you what you need to know about traveling with Scandinavia and Regional. READ ALSO: Baby Gorilla Naming Ceremony: Rwanda Development Board’s Kwita Izina. Akamba Bus is the oldest of the three services I will discuss. 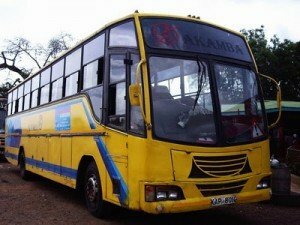 I am not sure when Akamba Bus came into existence, but my parents tell me that it existed even in their day. Starting with it being a good thing, Akamba Bus has a lot of experience ferrying passengers on this route and has mastered the art of doing so safely. Of the three bus services, Akamba Bus has the best and longest safety track record. During the 9 years that I have regularly traveled this route, I have never heard of a major road accident involving Akamba Bus. If safety, above all, is what you are looking for, look no further: Akamba Bus is the bus for you. As a bad thing, because of its age as a service, Akamba Bus buses are often no longer in the best of conditions and can be quite rickety. There are two ways that I know of to circumvent this problem. The first is to pay a little more and use the more up-market Akamba Bus service known as Akamba Royal. The other is to use a trick that I learned from a cousin who also makes this journey often: travel with a pillow to cushion “the blows”. This you can always do when traveling by bus anywhere in East Africa and goes a long way to making a bus ride a lot more comfortable. Akamba Bus travels between Nairobi and Kampala using two different routes. One route passes through Kisumu and crosses the Kenya–Uganda border at Busia. The other passes through Eldoret and crosses the border at Malaba. I am not sure why, but most people I know prefer to travel using the Busia route. Out of habit, I too used to travel using that route. The last time I traveled to Kampala, in order to avoid the very bad road between Nairobi and Kisumu, I chose to travel using the Malaba route. Akamba Bus buses serving the Nairobi–Kampala route depart from Nairobi several times a day, both during the day and at night. During the day, buses leave early in the morning, at 7 a.m.
At night, they leave at 7 p.m. and 10:30 p.m.
Akamba Royal, the up-market service of Akamba Bus, departs from Nairobi only once a day, in the morning at 7 a.m. I recommend day travel the first time you make this journey so that you get to see what lies between the two capital cities. Once you have seen what there is to see, I recommend night travel on all subsequent journeys. How Long from Nairobi to Kampala by Bus? The journey now takes 13 hours due to bad roads and government-imposed speed limits. Traveling at night makes this long journey seem much shorter since you can sleep most of the way. Traveling between Nairobi and Kampala by bus is inexpensive. The last ticket I bought for Akamba Bus’s executive service (the regular service) cost me only 1,400 Ksh, while the Akamba Royal service cost 2,100 Ksh. If day travel and money are not considerations, then I do recommend spending the extra money to travel by Akamba Royal. Akamba Royal, being a newer service, has more modern and comfortable buses and, in my experience, tends to be more prompt. I think I have told you all you need to know about traveling between Nairobi and Kampala using Akamba Bus. If you have any comments, or questions you would like to ask, please leave me a comment below. If you would like to contact the Akamba Bus offices directly, you can call them on +254-(20)-556062 in Nairobi and on +256-(41)-250412 in Kampala. Join me tomorrow to hear more about traveling with Scandinavia on this same route. The day after that, I will tell you about traveling with Regional. If you will be making this journey soon, I wish you a safe and comfortable trip. hey biche, i have enjoyed reading your blog. i will be travelling to east africa this august and am researching transport from nairobi to kampala, and your posts have been very helpful. i would like to go from nairobi to mbale. is there any way to do this trip without going all the way to kampala? i appreciate any help you could offer. Please excuse the time I have taken to get back to you. Yes, you can get to Mbale without going all the way to Kampala first. Akamba has a service from Nairobi to Mbale, as does Regional. I hope you enjoy your stay in East Africa! I am looking at Travelling by Road from Nairobi to Kigali. What solutions do you recommend ? Nairobi-Kigali: Well, honestly, I would recommend that you fly (if that’s an option) because the road between Nairobi and Kampala is currently horrendous! It’s in the worst state that I have seen it in the past 10 years. I love to travel by road, but the last time I had to shuttle between Kampala and Nairobi – I opted to fly. To stick to your specification about road travel, though. 🙂 I would recommend doing it in one of two ways. 2. The second option is to break the journey into two legs: Nairobi-Kampala and Kampala-Kigali. This is a good option if you are up to the adventure and are not pressed for time. The first leg would take about 12-15 hrs and could be done using Akamba or Scandinavian (my recommendations). The second would take 8 hrs using a service such as Jaguar or Regional (I quote only that which I know). Travelling using this option would enable you to schedule some RnR time in Kampala that could be used discovering a new city or visiting friends (in case you have any there :-)). Whatever the case, Kigali is the bomb! so it’s a journey that’s well worth making. I have used Akamba once and vowed not to do so again. The bus broke down part way to Nairobi and the conductor took the cover off the engine, tied a string to the throttle and they drove the remainder of the trip with the conductor managing the throttle by a string and the driver given hand signals to the conductor indicating more fuel or less fuel. As I was sitting in the front seat, I got fulll fuew of the procedure as well as the fumes coming off the engine. Since they knew exactly what to do, I assume that this was not an unusual experience. I have been on the Regional bus a couple of times since then and found the experience much more satisfying, although Regional did cancel my reservation in spite of having paid for the ticket in advance. Thanks for sharing that experience. That must have been quite harrowing to say the least! Nope, I have never had an experience like that on Akamba though Akamba breaking down happens often enough. Hello Biche and many thanx for your good rewiew on the bus services from Nairobi to Kampala. Im about to be travelling through east Africa in February and right now sort of planning my trip. Hi Biche, I am a Muhindi who lived in Uganda from 1994 to 1997 and again in 1999. I started the Simba Steel operations in Kampala. I used the Akamba service to transport a number of my colleagues and often urgent material from Nairobi. Just calling in to say your article jogged old memories – actually for my wife Pushya and I – Kampala was a honeymoon transfer from India. From the bottom of my heart – we loved and still love Africa. Welcome to ChickAboutTown! I am glad you found this review useful. I have just read the blog post you linked to in your comment, and I hate to tell you but that’s exactly the experience I had too when I last travelled to Kigali by bus via Kampala. The road is tortuous and the bus companies speed along the entire journey (without speed governors), even on the sharp bends in the hilly parts of southern Ugandan and as you enter Rwanda. Truth be told, I held my breath for the better part of the journey just hoping for the best. If you don’t want to take chances and can afford it, flying might be a better option. I haven’t taken the road through Tanzania since the early eighties so I really can’t tell you much about it. From what I know about Tanzania’s geography, though, I expect that be a much longer route. Does anyone out there know how long that journey would take? Of the two routes, I would generally take the route through Kampala, or else fly. I am glad that my site can bring a little bit of Uganda to you, wherever in the world you are (as I write today, I am actually writing from the beautiful city of Kampala). So you were in Kampala in the mid to late nineties? I remember those days well. Every time I would visit Kampala, during that time, I would be astonished at how fast the city was changing and developing! What did you like most about your stay in Uganda? ground transport between Kigali and Kampala! How about you break up your trip into two legs, Nairobi-Kampala and Kampala-Kigali? I am sure you can easily find safe bus transportation between Nairobi and Kampala, and then try to find a way to make it by car from Kampala to Kigali. For instance, might you consider renting a car? Or can you think of a group of people who might be interested in doing the trip by car with you? The route is fairly straight forward and if you go slowly enough, I think it might be safe enough for you to drive yourself, especially with company. The scenery on this journey is amazing! I can see why you wouldn’t want to miss out on it. Just throwing around a some ideas. young children? Any help really appreciated! Welcome to ChickAboutTown and thanks for the kudos! Yes, the busses are suitable for children, but in that case I really, really recommend using Akamba’s Royal Service. Although it is a little more expensive, the seats are usually wider, travel times are during the day, and the bus is less crowded. All in all, it makes for a more pleasant journey – one less likely to make children irritable and unruly. I wish you and your family an enjoyable journey! Thanks for the info on travel between Nairobi and Kampala . I am leaving tomorrow for Kampala using the Akamba Royal bus service. -The price for the royal service has gone up to kes2500.00/usd$32.00 for a one way ticket. I will update you on any changes. 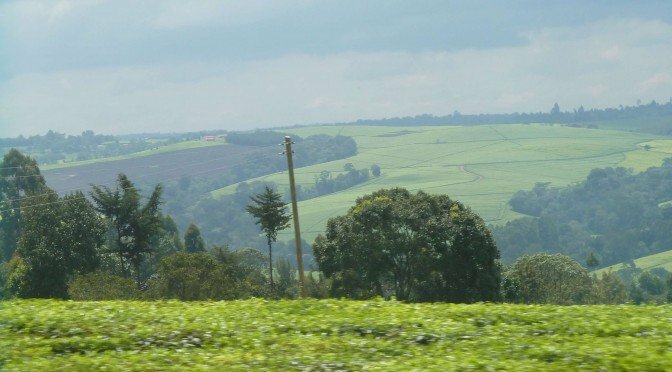 All I know is that the road from Nairobi to Nakuru is sweet….after that I have no idea. Finally any pointers on getting to Kigali for the weekend. Is it possible to go Friday and come back on a sunday? Thanks for the updates on travel with Akamba. That’s great information to have, particularly the part about some of the road being better. I haven’t traveled that road in a while, having been discouraged with it’s condition the last few times I traveled it. Maybe I’ll try it out again some time soon. Kigali for the weekend from Kampala is possible though might be hectic because it’s an 8 hour bus ride either way (I don’t know that night travel is available on this route). Check out Scandinavian, Jaguar, and Regional bus services which I believe all serve this route. I like Kigali quite a bit (with nothing I heard having prepared me for how clean and organized the city actually was), so it might be well worth the trouble to check it out over the weekend. Whatever you decide, I wish you a wonderful stay in Kampala and Kigali (if you decide to go). Once you are done with traveling, please come back here to share your experiences! Thank you for your posts, they are all very informative. My wife and I will be travelling from Nairobi to Kampala around the 28/29 June 2009. When and where can the tickets be purchased? Welcome to ChickAboutTown! I am glad you find my posts informative. You can buy Akamba tickets at any of their five offices in Nairobi (I think). I’ve bought tickets, in the past, from three of these offices – the Wabera Office, the Prestige Office, and the Town Office – though I am not too sure whether tickets can be purchased from the Head Office in Industrial Area or the Monrovia Office. For more information, consult the Akamba bus website for the locations and contact information of each of these offices. In my experience, you can buy tickets up to the day before travel (except during the Christmas and Easter seasons, where a lot more advance booking is recommended). To ensure availability for the desired travel date, I recommend purchasing your tickets at least three days before the expected date of departure. I hope this information is useful to you. Don’t hesitate to contact me if you have further queries. To the best of my knowledge, Akamba is not a publicly traded company, though I may be wrong. Here’s the company’s website to find out more: http://www.AkambaBus.com. I hope that helps. Hello Biche,Thanks for the information about Akamba.I had Used Abamba long time ago since i was still studying in kenya…Church army sec.school.i loved Akamba.I traveled using the bus to Greenfields College in Kitale.Now i am in Ny and i plan to come for vacation,so i chose totravel Akamba from kampala.Daniel. Thanks for your feedback. I wish you a safe and enjoyable trip with Akamba. I come from Japan. 7-10 years ago, many times I traveled between Kampala and Nairobi by bus, by using different companiese, by traveling night or day time. After all, I decided to take Akamba royal bus because it was so comfortable and I had thought it was the best. Then ever since I did not visit Kenya and Uganda again till last Fall. When I was going to buy a ticket at Akamba, my friend said on a way to Mombasa from kampala by Akamba royal, it was broken down and I was told it is better to travel by schandinavia, but I hardly believed that. So I did not listen my friend’s advice and traveled by Akamba royal from Kampala to Nairobi and my goodness, what my friend said was so true, between Kisumu and Nakuru, it was stopped completely and broken down, had to switch to another bus to ride and we had to wait for 2 hours, plus it was just ecnomy class (nor royal class) and I decided I would never use Akamba royal again…….Well, your article is so corret !!! Thank you all for your valuable input…i’m driving down to kigali on the 15th of august 2009…would anyone know how long the stop at malaba would be…i heard that they are pretty slow at processing the border crossing…is the busia route perhaps quicker ? and is the busia route a better road ? might have space for 1…anyone wanting to car pool ? Sorry, I know I am a bit late responding to your comment. Still, welcome to ChickAboutTown! Did you end up taking the Malaba route? How long were you stopped at the border (I’ve never used that route in a private vehicle)? Nairobi is nice place . Yes, Nairobi is a wonderful place. What in particular makes you say that, though? may I ask if the bus from Nairobi to Kampala stops at the city of Tororo? and where is the station in Nairobi? No, to the best of my knowledge the bus does not stop in Tororo. The Akamba station in Nairobi is near the Fire station on Tom Mboya Street. Here’s a map for clearer directions. i would like to know if the Akamba royal operates a bus directly from Nairobi to Kigali and what would be the cost. I wish the both of you a warm welcome to ChickAboutTown. Jeremiah, Wang is right – Akamba does serve this route (here’s an article to prove it). The cost of a ticket is 20,000 FRw one way, which is approximately $35. Wang, thank you for answering this question! Welcome to ChickAboutTown! I am not sure I understand your comment – where exactly are you interested in working? The night drive to Nbi was terrible as the bus was very very cold forcing me to stay awake & shivering a full 12hrs! 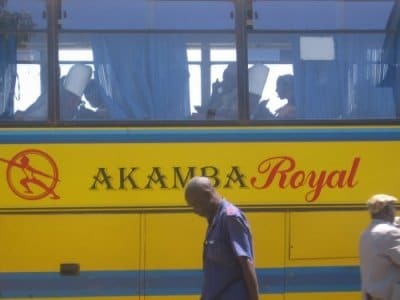 Does Akamba Royal have air conditioning & does it go direct to Kampala without stopping for passangers?Only stopping for toilet breaks.If not,pls recomend other good bus companies I can recommend to a friend. Welcome to ChickAboutTown! Sorry, it’s taken me so long to respond to your comment. I haven’t done the Nairobi-Kampala journey in a while, but to the best of my knowledge, yes, Akamba Royal has air conditioning and ONLY stops for bathroom/lunch breaks. In fact, in my experience, all Akamba buses are pretty disciplined about stopping only at official stops (unless there’s a breakdown or something of that nature). Sorry about the cold. I’ve also spent many nights shivering as I traveled between Nairobi and Kampala. The solution for me was to LAYER my clothes. I learned to do this during cold Canadian winters, and it worked like a charm fighting Rift Valley cold nights. Other than that, I’ve also found that Scandinavia Express offers the best insulation from the night cold. I am not sure that Scandinavia still operates between Nairobi and Kampala, but you could try and find out. Thanks so much for the kudos! Just wondering if there are frequent buses from Mbale or Tororo to Nairobi? Welcome to ChickAboutTown! I have never traveled on that route before, so I cannot say, but I believe there should be. Check directly with Akamba. Is the route from Nairobi to Kampala on Akamba Royal still 2500.00 KES? At the Malaba border crossing, are visas issued? Is the cost $50 for a visa here? Could I get off at Jinja if I so desired? Thanks! Your blog has been very helpful! Welcome to ChickAboutTown! For the most reliable answers, I recommend that you contact Akamba directly. Their website is AkambaBus.com. Off the top of my head: I believe you should be able to get a visa at the Malaba crossing; I am not sure what the current cost for foreign visas to Uganda is right now; and I believe you should be able to get off at Jinja. Good luck with finding more information for your trip! I am planning a trip to Kigali at the end of July 2014. Your post i very useful, i however am aware that Akamba is no longer operating. Which service would you recommend? Welcome to ChickAboutTown and thanks for leaving a comment! The question you ask is a bit of a difficult one for me to answer because I no longer live in Nairobi but I will try my best to give you a useful answer. If it were me, what I would do would be go to the top of River Road, the side near Fire Station (see map) where most of the buses that travel the region have an office and find one that goes to Kigali. If Regional is still open, then they should operate on that route (warning: I overturned while traveling on Regional so I can’t vouch for their safety!). Otherwise, further down on River Road, Kampala Coach also should serve the Nairobi-Kigali Route, and I’ve used them recently to travel from Dar es Salaam to Kampala. Their buses are spacious and quite comfortable, but alas nothing quite compares to Akamba in terms of safety, reliability, and range of destinations. Good luck on finding the perfect bus for you! P.S. Out of curiosity, I’d love to know what you eventually settle on and what your experience on that service is. Come back and let me know in another comment! Thanks for your reply. I never got around to going for the trip. I have been away for work but i am still planning to have an ‘Est African’ trip. For this Easter I am planning to do Kisumu-Kampala-Kigali-Mwanza- Kisumu spending at least two nights in each of these places. I will let you know how it goes. That sounds like a lot of fun, Kiterana. How do you plan to travel from Kigali to Mwanza? Is there a bus that plies that route or will you fly? Want to travel from Nairobi to Kigali..how much is it? Welcome to ChickAboutTown. Unfortunately, I have never traveled from Nairobi to Kigali in one go, so I have no clue how much it costs. Maybe you can check with a bus service such as Regional. Welcome to Chick About Town! Yes, sadly Akamba folded after more than 50 years in service. I have traveled with Kampala Coach before but am yet to try Simba Coach. Thanks for the recommendation and info on the fare. Wow, that’s quite a bit more expensive than I remembered the price when I used to do the journey more often. Great experience here on long distance road travel. You’ve really taken you time to give details on what it entails and the options one has. Nice one! I am planning a trip to Kenya and Uganda with my husband and 6 year old child. I was thinking of taking the bus from Nakuru to Kampala or Jinja in the day to see the countryside. Do you know whether there are buses from Nakuru to Kampala or jinja, and should I book tickets in advance or simply just get to Nakuru and hop on a bus? Welcome to Chick About Town, and thank you for your comment. Yes, there are many buses from Nakuru to Kampala and Jinja. The main route they ply are Nairobi-Kampala, with Nakuru and Jinja both being stops on that route. It should be very easy to get a good bus for the trip you want to make. And I totally understand why you want to make it: the scenery is gorgeous! (I just rode that route last week myself). My preferred bus on this route right now is Modern Coast Express. You could get to Nakuru and just hop on the bus, but you could also buy a ticket once you get to Nairobi. I prefer to purchase my bus tickets a day or two before I travel just to be sure that I will be able to travel on the dates I want. I couldn’t make the trip out to Kenya & Uganda last year, but planning for this year. Do you still recommend the bus from Nairobi to Kampala? Thinking of hopping on at Nakuru. My bus recommendation still remains the same. Apparently you can even book them online here: https://modern.co.ke though I have never tried to do that myself. I wish you a great trip if you make it this time, and happy holidays! Please am Goodluck by name,I want to travel from cameroon to Kenya Nirobi,how possible is it for me to get there,by road transport,and which transport company can take from cameroon,Or can i go by stoping to nearby contrries first,My destination is Nirobi,and i want to go by road ,anybody with good direction and transport company from cameroon,to enable me get there in kenya. Welcome to Chick About Town, and thank you for your comment. Wow, that’s an ambitious journey you are wishing to undertake, but if you make it, I am sure it will be so worth the experience! I have never heard of a bus company that plies the route Cameroon-Nairobi. Looking on Google map, it seems you would have to go through Central African Republic, South Sudan, and Uganda. The advice I can give you is for the last leg of your journey. For that I recommend taking Modern Coast Express from Kampala to Nairobi. How you get from Cameroon to Kampala, though, I have no clue. I hope that helps somewhat. In december I hope to go backpacking through uganda for three weeks. After I saw this blog I came up with the idea of taking the bus from Kampala to Nairobi. Currently I’m looking for a visa for Uganda and Kenya. For this the requirement is to have ticket for leaving the country. Do you know if I can book one if these busses online. So I can maybe apply for a east Africa tourist vision and visit Uganda Kenya and maybe even Tanzania. Welcome to Chick About Town! I am glad my blog has inspired you to visit more of East Africa. There’s lots to see, and I am sure you’ll have a trip to remember. I am glad you asked the question, because until I tried to get you an answer, I had no clue that you could book bus tickets between Kampala and Nairobi online. As you must have read at the top of this post, Akamba is no longer operational. Whenever I bus across East Africa (Kenya, Tanzania, Uganda, Rwanda) nowadays, I use Modern Coast Express, which I have just learned has an online booking engine (https://modern.co.ke/). I have never used the online booking option but I can vouch for the bus service. Very True. Modern Coast is the best for this route and possibly in all East African Routes (Kigali, Dar Es Salaam, Arusha, …). I have used the buses and they never disappoint. mash East Africa is also reliable as a second option. Modern Coast rocks, I cannot say enough how much! I, not so long ago, spent a journey from Nairobi to Dar es Salaam on Modern Coast watching a season of Game of Thrones on my laptop. Think how fast that journey went. And all because they have power sockets at each seat. I am not sure I have ever used Mash before. I’ll look out for it if ever I am in a positon where Modern Coast is not available.